A community-minded roofer was nominated as a ‘Local Hero’ for his inspiring acts of generosity for the National Federation of Roofing Contractors’ 2018 UK Roofing Awards, sponsored by SIG Roofing. John Davis of JD Roofing was recognised by staff at the SIG Roofing Wigan branch, who regularly hear about his local community support and how incredibly highly people speak of him. 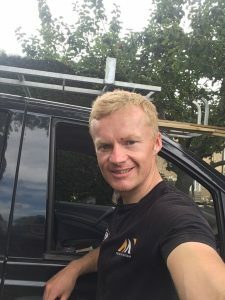 John frequently goes above and beyond for those in his community, particularly the elderly or less well-off, by fitting or replacing their roofs for a discounted rate, or for free. The staff at SIG Roofing’s Wigan branch also explained how the roof of a heavily pregnant woman was left in a bad state, whereby John took it upon himself to fix the roof free of charge, costing him hundreds of pounds. Throughout his roofing career, John has been no stranger to being generous.